Using a mouse model of the disease, scientists at Georgetown University and the Frederick National Laboratory for Cancer Research developed a novel nanoparticle to carry genetic material into pancreatic tumor cells. The genetic material inactivated gastrin, which stimulates the growth of pancreatic cancer. Without gastrin, the cancer cells did not metastasize (grow or spread), and nearby healthy cells were spared. Pancreatic cancer is the most aggressive of malignancies. It spreads rapidly and lacks an effective treatment. The National Cancer Institute estimates 55,440 people will be diagnosed with pancreatic cancer in 2018. Fewer than 1 in 10 of these individuals is expected to survive for 5 years. Stern was a co-lead on the study along with Jill P. Smith, M.D., professor of medicine at Georgetown University and Lombardi Comprehensive Cancer Center. Smith’s laboratory previously discovered an abundance of gastrin receptors dotting the surface of pancreatic cancer cells, and that gastrin, the main hormone that binds to the receptor, stimulates the cancer’s growth. Smith sought to develop a treatment that could target the receptor using gastrin small interfering RNA (siRNA). siRNA is a type of RNA that binds to complementary nucleotide sequences, interfering with the expression of specific genes—in this case preventing gastrin production. Because healthy adult pancreas cells do not produce gastrin, targeting gastrin and the receptor yields no off-target effects and has low toxicity, which is another benefit over traditional toxic chemotherapies. However, efficiently delivering the gastrin siRNA proved to be a challenge, as the siRNA rapidly degrades in the body and consequently fails to reach the tumor. To overcome this challenge, the Nanotechnology Characterization Laboratory formulated a nanoparticle that can safely transport siRNA. It specifically targets the receptor—carrying the gastrin siRNA directly to the tumor. Stern compared the nanoparticle delivery system to the legendary Trojan Horse and explained that the cell sees it as gastrin and brings the nanoparticle into the cell, and then the siRNA is released. He also noted that its targeting ability is unusual. To date, the nanoparticle has been tested in two unique mouse models for two types of human pancreatic cancer. None of the treated mice showed evidence of metastatic disease—a finding that surprised even the investigators. In one model, it also produced a statistically significant reduction in the primary tumors. Because most patients die from metastasis and not the primary tumor, the findings are encouraging. Smith’s laboratory is looking to test it in mice that have normal immune responses next to further validate the findings. The results of these studies were published in Cellular and Molecular Gastroenterology and Hepatology. The investigators also filed for a joint patent so that industry could eventually license and further develop this technology. The investigators cited multiple future directions for this research. Stern stated that the nanoparticle could be given in combination with other therapies, such as an immunotherapy, and he indicated that this technology also shows potential as part of a future diagnostic tool. While the research is still in early stages, eventual testing in humans is also a goal. Smith described how this nanoparticle could be leveraged against other cancers. This research collaboration is one of several between Georgetown University and the Frederick National Laboratory. The two institutions recently signed a memorandum of understanding for further collaborations on biomedical research and training. 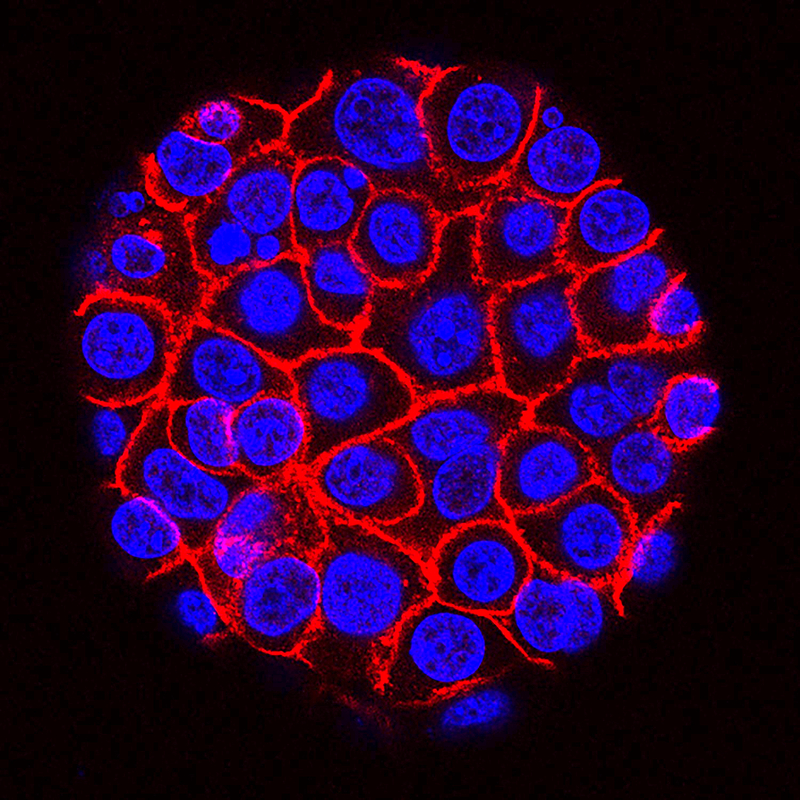 Top image: This image shows pancreatic cancer cells (nuclei in blue) growing as a sphere encased in membranes (red).​ National Cancer Institute image. Bottom image: Graphical abstract from Cellular and Molecular Gastroenterology and Hepatology article.